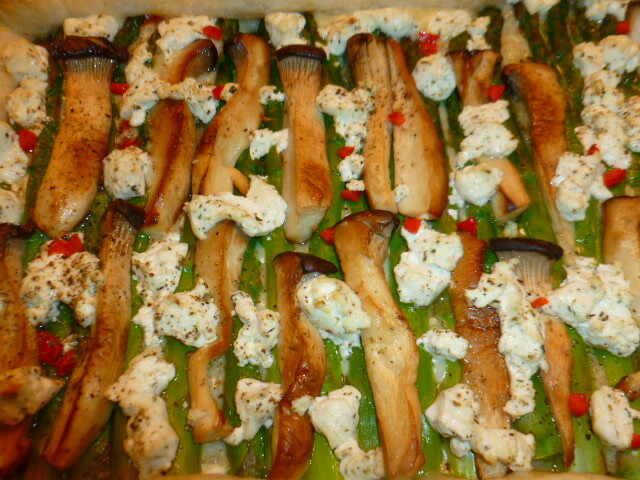 The combination of asparagus and mushrooms is one of my favorites. Their flavors and textures seem to work so well together. I like to sauté them together and mix with cooked pasta, grated Parmesan cheese and good olive oil, or serve with polenta. 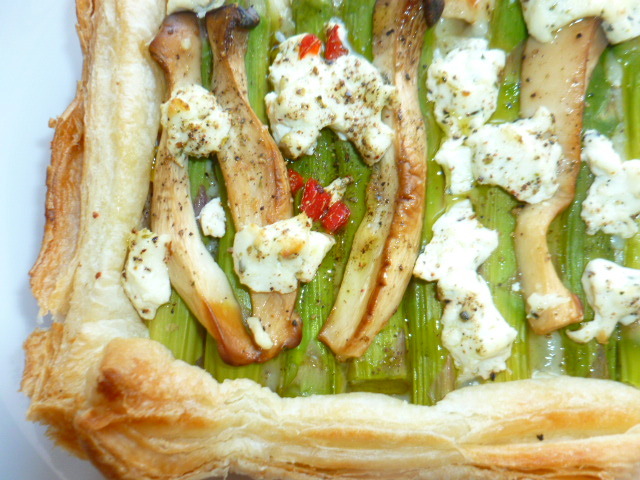 But when I saw these wonderful King Oyster mushrooms at the store, I thought it would be a shame to just chop them, so I’ve decided to use their unique shape with whole asparagus in this tart, which is very quick and easy to assemble and is just perfect for brunch. As is the case with most dishes that contain a few ingredients and do not rely on cooking expertise, the result depends heavily on the quality of the ingredients. 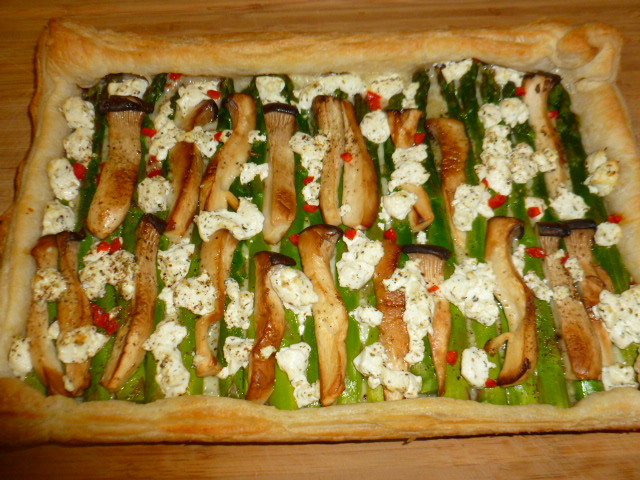 Make sure to start with good quality puff pastry (preferably homemade with butter (also available online), or at the very least one that is made with non hydrogenated oil), add to it fresh Asparagus, mushrooms and goat cheese, and your dish will be a hit. 1. Preheat the oven to 420F (215C). 2. 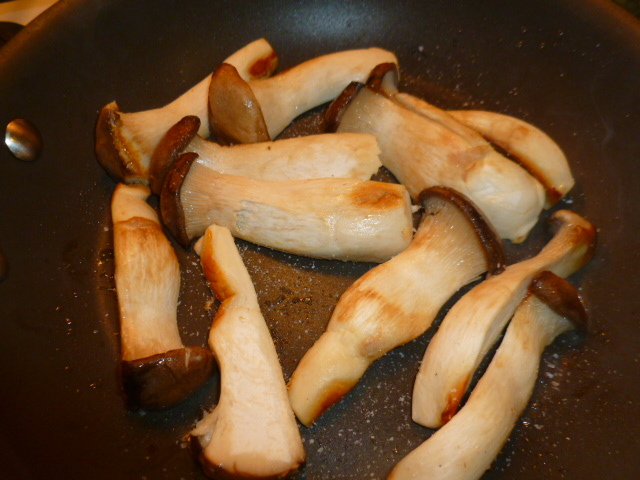 Cut the mushrooms in half, lengthwise. 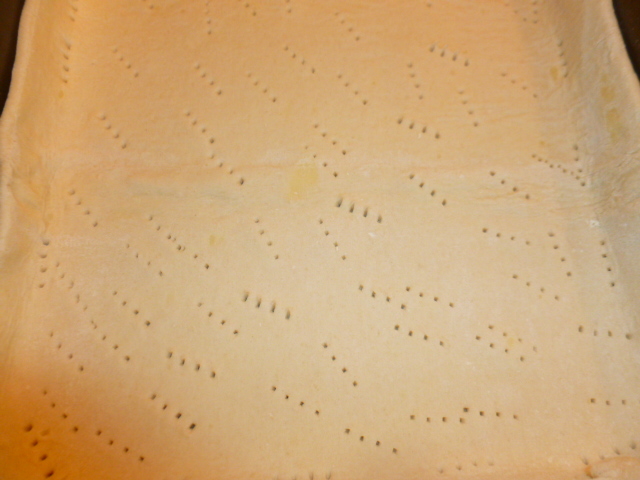 Cut each half, lengthwise, into 2-3 sections. Heat 1 Tbs of the olive oil in a pan on medium heat, and add the cut mushrooms. Sprinkle with salt and pepper and fry gently on all sides for 1-2 minutes. Take off the heat and bring to room temperature. 3. 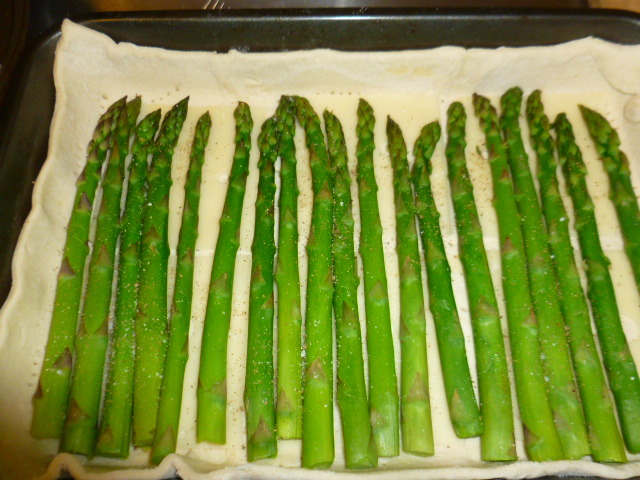 Cut off about 1” (2.5cm) of the asparagus ends and place in a large pan, in one layer. Add the water and sprinkle with salt. Cover the pan and bring to a boil on high heat. 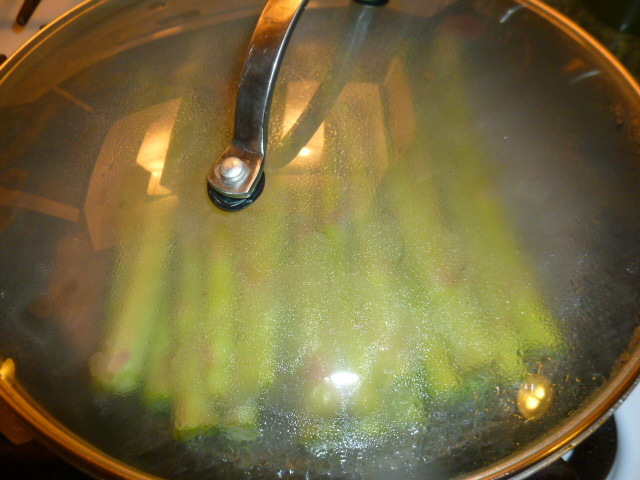 Lower the heat to medium and let steam for 1-2 minutes, until the asparagus is bright green, tender but still firm. Place on paper towels and bring to room temperature. 4. 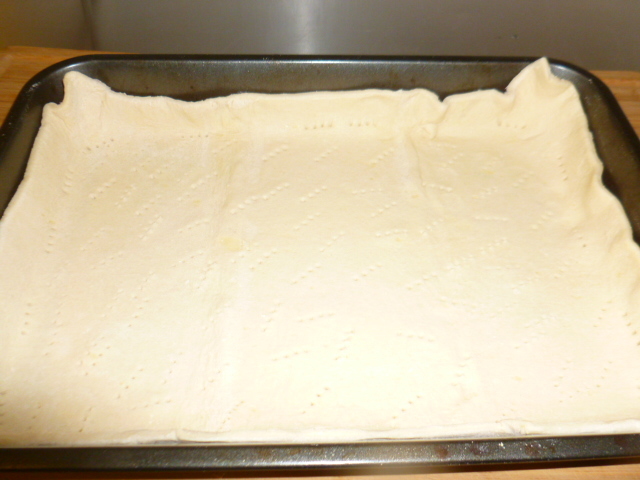 Line a 12”x8” (20cm x 30cm) baking pan with the rolled dough, pressing the edges of the dough to the sides of the pan, to create a rim. Prick the dough all over with a fork. 5. 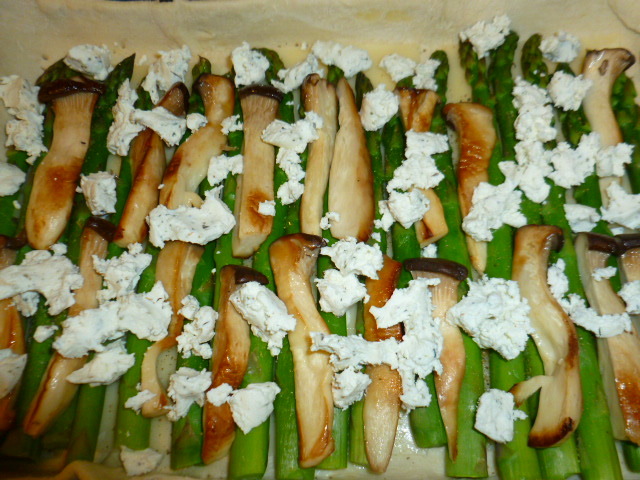 Layer the Swiss cheese slices over the dough and add the asparagus and the mushrooms. Crumble the goat cheese on top. Scatter the red jalapeno, drizzle 1 Tbs olive oil and sprinkle with a bit more salt and pepper. 6. Bake for about 20 minutes, until the dough is puffed and golden, starting in the lower part of the oven for the first 10 minutes and finishing in the upper part of the oven. 7. 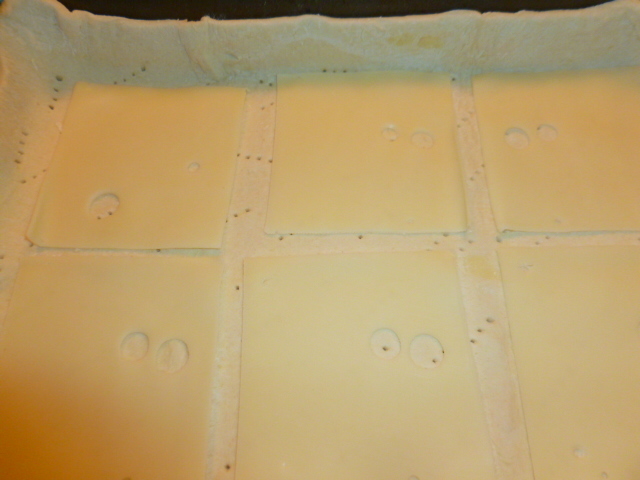 Take out of the oven and let rest in the pan for 2-3 minutes, before carefully transferring to a large cutting board. Portion with a large, sharp knife, drizzle the remaining 1 Tbs olive oil on top and serve. Those mushrooms look amazing! The whole tart looks delicious. So fresh and vibrant! Looks fantastic! I’ve never noticed king oyster mushrooms in the store before – I’ll have to seek them out. I imagine the two cheeses you used really make this flavorful. 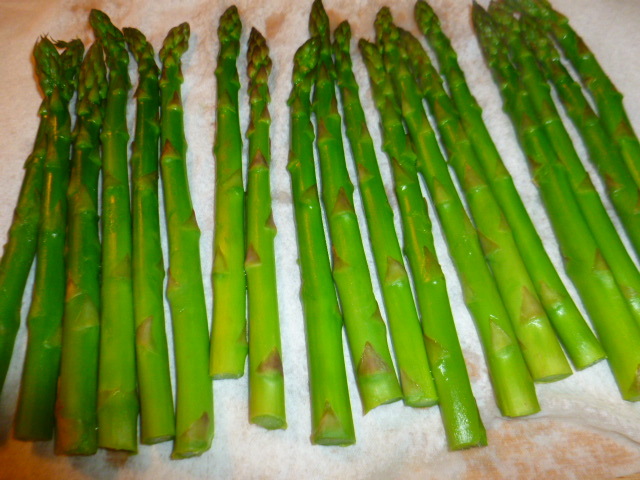 The asparagus farm up the road from should be opening in the next month or so…therefore, I’m bookmarking this recipe to save for the farm fresh spears. Delicious offering! The tart looks wonderful. I can almost smell it! 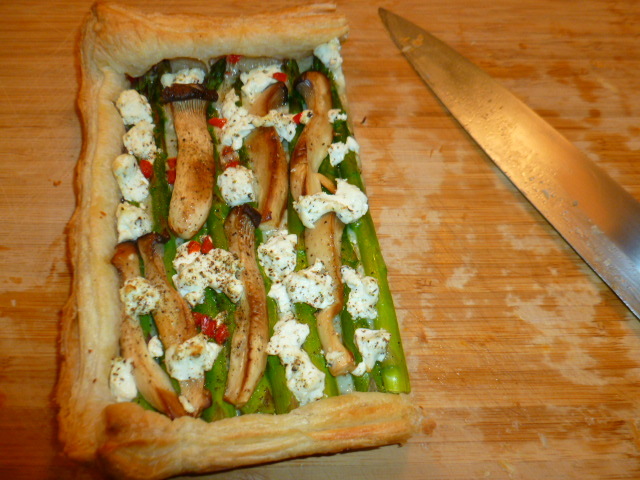 I have asparagus that is almost ready for picking so this tart will be my first use of this season’s crop. Thank you Philip! I’m glad you liked the idea. Now this is what serious food cooked by a professional chef looks like. Fabulous, Chef Ronit! I know my family would love this, including my mushroom-aversed son. Err…maybe he would pick off the mushrooms. Speaking of which, I’ve seen these mushrooms before but have never tried them. All stalks and very little caps. Do you find the stalks to be tender? Not like shiitake? Just what I needed to see. I have such a craving for asparagus. Lovely idea. Oh this is the dinner I wanted! I’ve tried the king oyster just a couple of times, I really liked them. They are really versatile, don’t they? 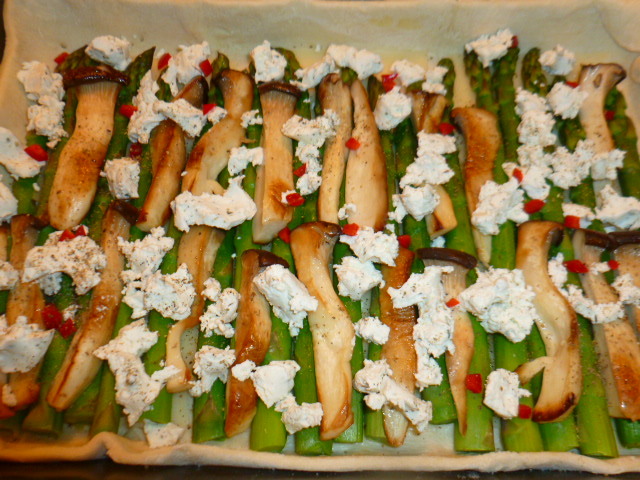 the match with asparagus and goat cheese had to be great! 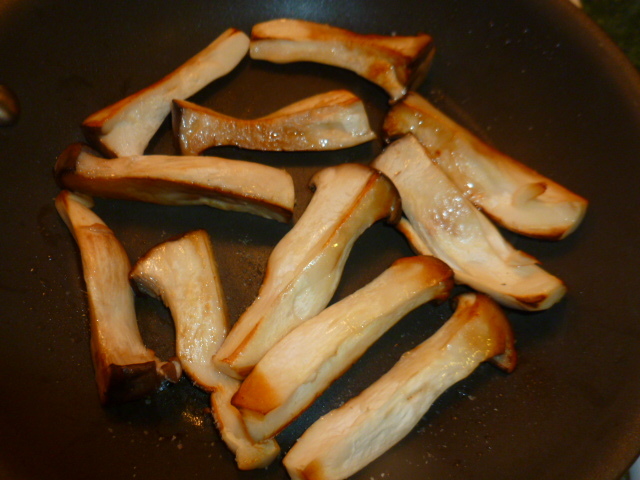 I too liked the King Oyster mushrooms – they are indeed versatile, and very flavorful. 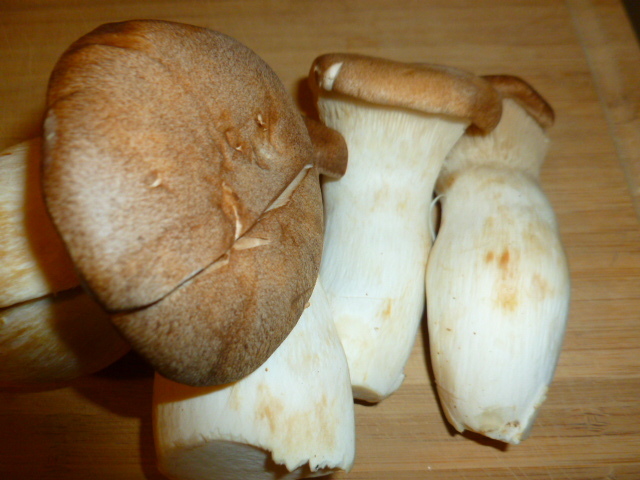 The Oyster King mushrooms are also quite a late discovery for me too – they are not as available as other types of mushrooms. But their special flavor and texture are worth looking for. Very nice!!! Simple and super tasty! I’ve been wanting to try king oyster mushrooms…thank you for the inspiration. Your tart looks great. This is s wonderful creation, Ronit! I agree with you that mushrooms and asparagus compliment each other so well, though I’ve not seen king oyster mushrooms around here. Coincidentally, I was in a grocery today looking at their mushrooms on display. This time of year, more varieties become available. I’ll be sure too look for them. I always wanted to try King oyster mushrooms. Looks delicious ! Perfect dish for early spring! 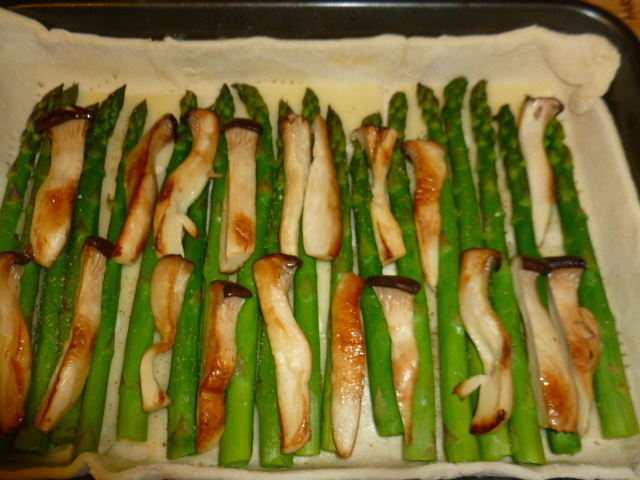 I love the combination of asparagus and mushrooms, too and will keep your lovely tart recipe in mind. I have to say this is just BEAUTIFUL! The green, red, and white together—just gorgeous!